In 1985 Gibson commissioned Korea based Samick Guitar builders to begin making a few models under the Epiphone trademark, moving their manufacture from Matsumoku Japan. The most popular of them was the Sheraton II. A run of about 50 were made with the first version of lettering on the headstocks. These were premium quality instruments but the logos were a bit unrefined. Buddy Black has been searching the world for these rarest of the Sheratons and as of this writing has found and purchased 2. Buddy says, “I would have loved to have been in the Gibson board room when the Samick representatives walked in with the first ones. Not sure if there was laughter involved, but I expect they left with urgency to make a more acceptable model! !” There were at least 2 more subsequent states of headstock lettering that were increasingly better refined. All of the Korean made Sheratons are examples of superior fit and finish. They play like a dream with very low action. The frets are smooth as silk, binding is nearly perfect and the paint is as well masked and applied as anything Gibson ever did. They mirrored the upscale combination of mother of pearl and abalone position markers used in the 50’s and 60’s models. 5 layer binding around the neck and headstock and 6 layer around the top. Those were accented by a thin layer of black between the binding and the body color. As in the better Gibson models, they have binding nibs at the fret ends. They even bound the f-holes! 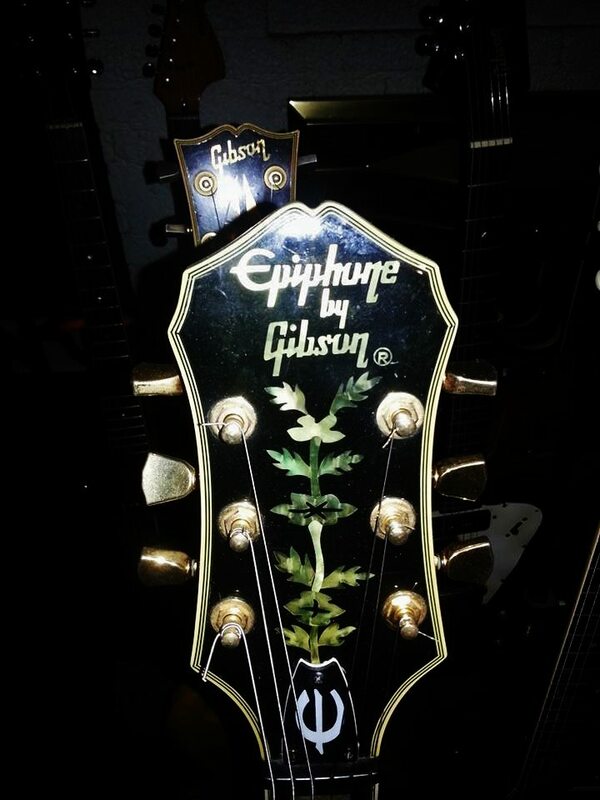 About 1989 Samick changed the headstock logo to only Epiphone, with Gibson etched into the truss rod covers. The gold plating is as sturdy as Gibson. All said, they are some FINE guitars. 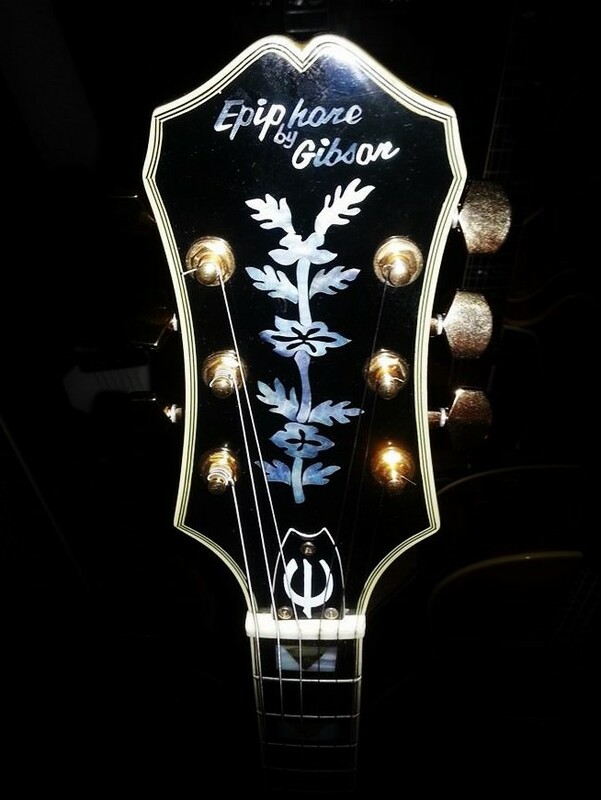 Under the ownership of Epaminondas (“Epi”) Stathopoulo, Epiphone was a leading manufacturer of hollow-body and archtop guitars. Epi Stathopoulos died in 1943. Control of the company went to his brothers, Orphie and Frixo. In 1951, a four-month-long strike forced a relocation of Epiphone from New York to Philadelphia. 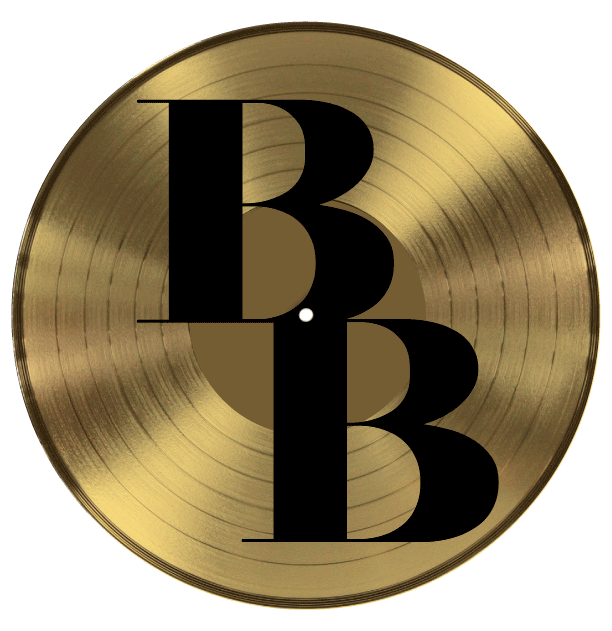 The company was bought out by their main rival, Gibson in 1957. 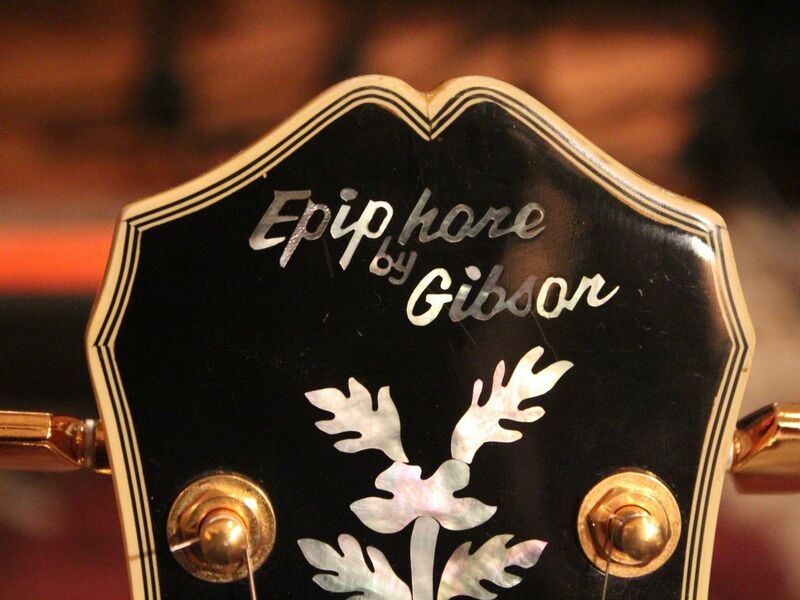 In 1958, Gibson began to expand upon its Epiphone line of semi-hollow guitars. They reworked Epiphone’s old Century archtop into a thinline electric fitted with a single P-90. This was followed by the introduction of a twin-pickup, double-cut thinline semi-hollowbody, the Sheraton. The original Gibson-made Epiphone Sheratons were up until 1970, when production moved to Japan, and major design changes began to occur. Gibson used the same body for the Sheraton as it was using for its new ES-335, ES-345, and ES-355 models. It featured the same double rounded horns, and had similarly placed electronics. The Sheraton was fitted with a set glued-in neck, in accordance with Gibson’s standard practice. Distinguishing characteristics of the Sheraton included its multiple body binding (like that of its top of the line Gibson cousin, the ES-355); its Frequensator tail piece; and its headstock and fretboard inlays. 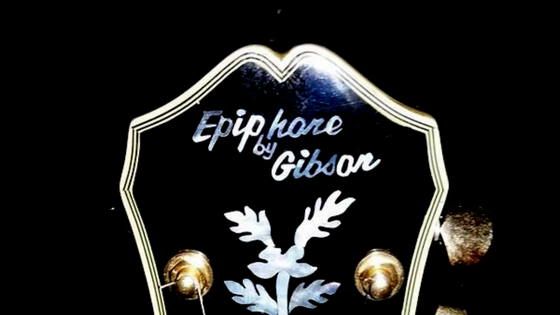 Unlike any of the semi-hollowbodies in the Gibson line, the Sheraton’s headstock featured Epiphone’s traditional fancy vine (or “tree of life”) inlay on its headstock, while its fretboard featured a block and triangle (or “V”) inlay of mother-of-pearl and abalone, as well as binding on the fretboard’s surface, inset slightly from the outer edges. 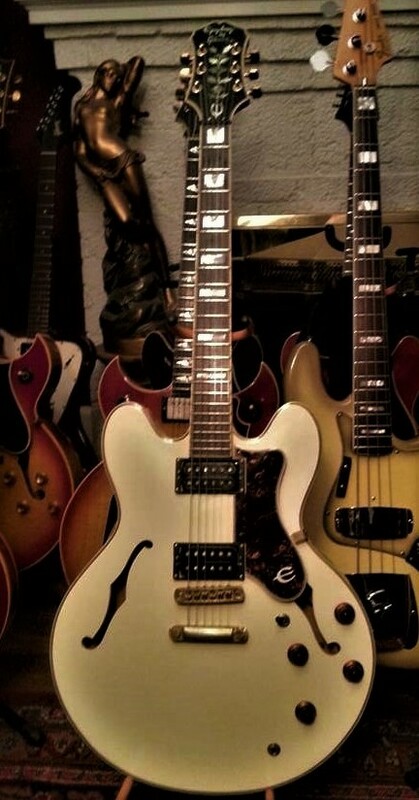 Thin body, double cutaway, semi-hollow with solid maple block down center; 2 Epiphone “New York” (single coil) pickups; 2 volume and 2 tone controls with white ‘carousel’ knobs, and a pickup selector switch; tune-o-matic bridge with no retainer wire; gold plated metal parts; Frequensator tailpiece or Bigsby vibrato; bound tortoise-shell pickguard; Epiphone ‘E’ tuners; multiple bound top and back; single bound rosewood fingerboard; abalone/pearl block “V” fingerboard inlays, neck joins body at 19th fret, 5-piece neck (from remaining Epiphone-built inventory) has a “V” chunky back shape; tree of life pearl peghead design; sunburst or natural finish. 1961 Sheraton specs: Parts begin to change to Gibson-made parts. The pickups are changed from the New York single coils to mini-humbuckers, knobs become gold gibson bonnet knobs, tuners become Grovers. Serial number now pressed into the back of the peghead between the D and G tuners, in addition to being on the blue Epiphone label in the bass “f” hole. The new Epiphone “Trem-o-tone” adjustable vibrato tailpiece is introduced. 1962 Sheraton specs: Production changes from NY-made Epi necks to Gibson-made mahogany necks. Cherry red finish introduced (this will remain the rarest Sheraton finish throughout Gibson’s production period of the 1960s). 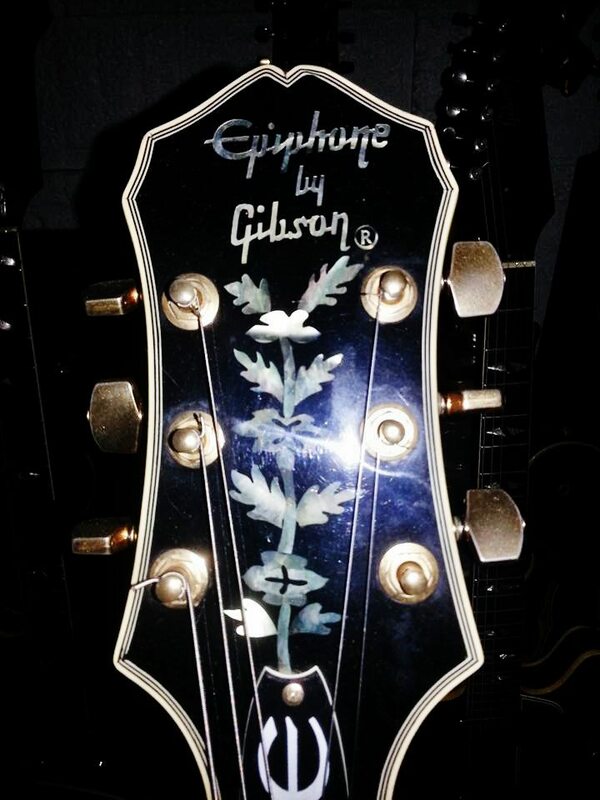 “Epiphone” script inlay on headstock becomes more streamlined in appearance. 1963 Sheraton specs: Peghead shape becomes more elongated. Binding on fretboard moves to outer edges (no longer inset). 1965 Sheraton specs: Sunburst finish becomes more two-tone (tobacco to amber). Late 60’s to 1970: Neck width narrows to 1 9/16″, as on many Gibson-made guitars of the era. In 1970, production ceased in U.S., and began in Japan. Mini-humbucking pickups were discontinued on the Sheraton, changing to standard full-sized humbuckers; serial numbering system changes. Body and headstock shapes began to evolve, as they will continue to do throughout the 1980s and into the 2000s, as production also shifted from Japan to Korea. Korean build manufactured up until at least 2012 however serial numbers changed to an all number type after 2008. To tell if it’s Korean built, it will have the following prefix: I=Saein, S=Samick, U=Unsung, and R or P=Peerless and if all number type serial number will be identified (Unsung for example) as ’21’ as the 5th & 6th numbers.